If you’re looking for a down comforter that will be by your go-to blanket for years to come, the Alberta Euro Down Comforter from The Company Store is one of the most popular choices. This quality down comforter will give you peace of mind with a lifetime guarantee and a six-step process to ensure that this comforter is hypoallergenic. But what really sets the Alberta Euro Down Comforter apart is the fact that it is machine washable. The combed cotton shell has a sateen finish and a thread count of 300. While a few other quality down comforters are machine washable, it’s a rare perk to find one that can handle the rigors of machine washing and remain tight against leaking feathers. This one proves to be an exception and its well-loved by people for this convenient feature. In addition, this comforter is available in light, medium, and extra warm weights. The fill power is anywhere from 600-650 and is European down. The company also participates in RDS-certified feather sourcing, so you can be confident the feathers are responsibly obtained. Adding to the tremendous value of this down comforter is the fact that it features a baffle box construction to keep the down fill from shifting as you sleep. For just a couple hundred dollars, depending on the size comforter you need, you can have a machine-washable, quality European down comforter with a lifetime guarantee from The Company Store. If you don’t want to break the bank to enjoy the soft, lightweight feel of a down comforter, look to the Siberian Goose Down Comforter from Egyptian Bedding. This budget down comforter features 70 ounces of fill, which is a combination of down and feathers. It has a fill-power of 750. 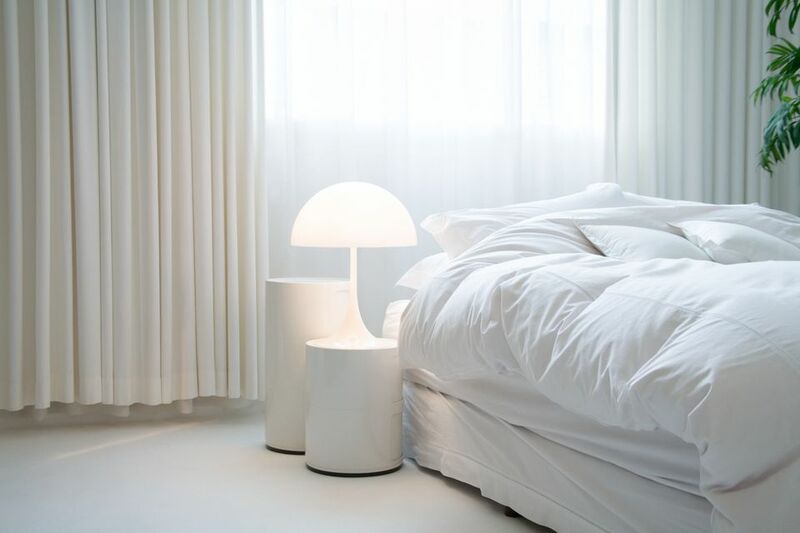 The Egyptian cotton cover is soft to the touch and has a thread count of 1200—although admittedly thread count is not always the determining factor of how soft to the touch a comforter is. A few people did find this down comforter to have a crinkly texture and sound to it but still found it to still be incredibly comfortable to sleep under. It’s worth noting that this comforter doesn’t carry the RDS-certified feather sourcing label that other higher-end down comforters have. Additionally, there is a lot of debate around the label of ‘Siberian goose down’ and whether it’s really any different from typical goose down. But keep in mind that for a budget down comforter, this one excels thanks to its fill power and baffle box construction to keep the generous fill count in place. Some people experienced feather shedding with this comforter, but the company was quick to make it right—and the majority of people have been very satisfied with this budget down comforter for well under the $200 price point. Are you looking for a down comforter to keep you cozy through the winter and cool through the summer? The answer is the all-weather down comforter from Brooklinen. Known for their super soft and high-quality bedding, the Brooklinen All-Season Down Comforter has a sateen shell with a 400-thread count for superior feel and a tight weave that protects against feather loss. This down comforter is also made in Canada from Hutterite white down and has a fill power of 700. While hot sleepers may find this to be a bit warm during more seasonal temperatures, it's​ a great choice if you want a down comforter that is also a match for winter weather without being really heavy. Overall, the Brooklinen Down Comforter lives up to the reputation established by the company’s famed bedsheets. It’s a bit of an investment, but the quality construction and Canadian manufacturing make it a solid choice. Go for the all-season down comforter from Brooklinen and never fear the temperature swings of summer nights or winter mornings. For the ultimate sleeping experience in cold weather, reach for the Bavarian Arctic heavyweight down comforter from Feathered Friends. This heavyweight down comforter packs a fill power of 850 and is the fluffiest, warmest down blanket you will ever need. It features sewn-through construction to keep fill in place and maintain a pillow-pocket appearance. The outside of the comforter is a soft woven cambric cotton, but the real star is the European white goose down. While both duck and goose down can make an excellent down comforter, goose down is available in the higher fill powers—like the 850 fill-power of this comforter. The down used for Feathered Friends products is also trackable and ethically-sourced, making it a smart buy. All of the components are sent to Seattle, where final assembly of this blanket takes place. Heavy weight down comforters aren’t cheap, so you can expect to pay a considerable amount for this down comforter—but it will keep you warm even on the coldest of nights! Choose a lightweight down comforter to keep you cool and comfortable all year long, like this 550-fill power down comforter from Pacific Coast Feather Company. The Light Weight Down Comforter from Pacific Coast Feather Company is a favorite of people who are hot sleepers or live in warm climates. This down comforter has a 550-fill power, though it’s not easy to identify whether it’s goose or duck down inside. 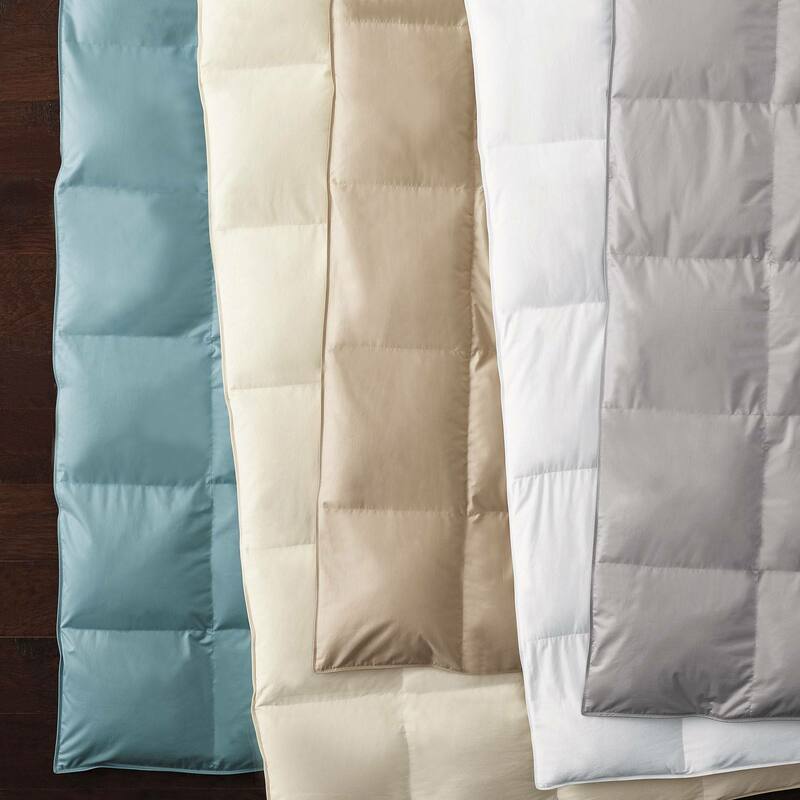 Either way, the construction of this lightweight down comforter is what sets it apart. This comforter has sewn-through box construction, which is designed to minimize the shifting of the fill inside. Additionally, Pacific Coast designs their down comforters with a Comfort Lock border to prevent the fill from shifting away from your body and down to the sides or bottom of the comforter. This minimizes cold spots and makes for a more enjoyable sleeping experience. When you have a lightweight down comforter with a lower fill power for the sake of temperature control, you don’t want to lose all the fill to the edges of your blanket! Choose the Light Weight Down Comforter from Pacific Coast Feather Company to enjoy a cool, comfortable night of sleep. If you’re prepared to spend a serious sum for the ultimate in a luxury down comforter, there is no substitute for a Scandia Home comforter. Take a look at the Vienna line for serious quality without compromises. The Vienna luxury down comforter is filled with Polish white goose down and has a fill power of 750. This blanket will offer plenty of loft and keep you warm even on chilly nights. The shell of the comforter is a 350 thread-count cotton batiste made at a hand-selected German mill. All the components are sent to the United States, where each blanket is assembled by hand and furnished with a certificate of authenticity. As you may expect, a luxury down comforter like this one breaks four figures. But it carries a limited lifetime warranty and is a blanket you can expect to use for many years to come. The high-quality components, handcrafted in the United States construction, and lofty fill make this a down comforter worth splurging for.